This is a new publishing venture, set up by Jean McNiff, and dedicated to publishing texts about action research and practice-based research. Because we have only just begun, our portfolio is still quite small. 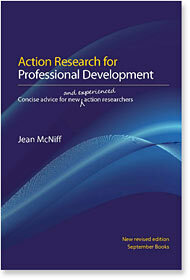 You can see one book by Jean, titled Action Research for Professional Development: Concise advice for new (and experienced) action researchers. You can also see an archive of books that are now out of print, but a few copies remain to be sold at inexpensive rates. A main reason for setting up the publishing house is to encourage and enable new and also experienced action researchers to write up their work and place it in the public domain. This is part of Jean's commitments to helping people to speak for themselves and let their voices be heard in the public sphere. So if you have a good idea, and would like to find ways of turning it into a great one, please contact Jean who would be glad to discuss it with you. You can contact us at info@september-books.com or you can write direct to Jean at jeanmcniff@mac.com. Either way, we will respond as quickly as possible. All our books are priced to include post and packaging.